even though it may feel like a low point in your life. I had been asked to emcee our community’s Christmas concert. The choir was singing the traditional Christmas portion of Handel’s Messiah, so I was researching the background story to this most famous of all Christmas concerts. As with all masterpieces, there is a back story. Handel was born in Germany in 1685. As a young man he was fascinated with music, and moved to Italy to compose opera. However at the beginning of the 18th century there was deep conflict over what counted as secular or sacred music, and the Pope had banned opera. Handel found himself having to adapt to writing sacred music. At 22 he became quite famous for his Dixit Dominus (‘Thus says the Lord’) composition. Discouraged by all this controversy Handel moved to Germany and then to England. At age 40 he moved into a flat on Brook Street in London. His dream of writing opera had proven difficult. Occasional success meant his personal finances were up and down. Then at age 52 he seems to have suffered from a stroke which paralysed his right arm and blurred his vision. This ended his keyboard performing career. Depressed and deeply in debt, he gave up opera. Being more of a composer of music than a writer of lyrics, Handel was constantly looking for good words he could put to music. At this low point of his life he came across a libretto (text intended for an extended musical work) composed by Charles Jennens. 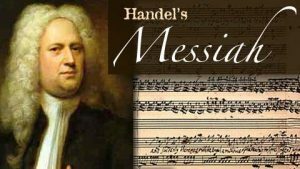 Composed entirely of Scripture portions from the Bible, mainly from the OT, Handel was deeply affected when he read this libretto about the life of Christ. It was performed the first time the next year, 1742, in Dublin. King George decided that this work was worthy of being attended, and this in turn led to one of the most interesting traditions connected to this masterpiece. When the Hallelujah chorus began to play the King abruptly stood up, apparently as a way of indicating he recognized that Christ was the King of Kings. It was normal protocol that if the King stood at any time everyone else would as well. So the entire audience stood for the performance of the Hallelujah Chorus. This tradition has been maintained ever since. Handel would never have anticipated that this particular composition would be performed for 250 years and become perhaps the worlds most performed musical composition of all time. So my friend, you too, could be at the cusp of your best creativity, even if it feels like a low point!